The recent hot weather has re-enforced my concerns about pond aeration. The hotter it gets the less oxygen there is for your your fish. And that can start a chain reaction in your pond with disastrous consequences. In general fish need more than 5 parts per million of dissolved oxygen. At 90 degrees F, 32 degrees C, the maximum that the water can hold is 7 PPM. So sustained high temperatures will increase the water temperature reducing the oxygen available. It will also increase evaporation, further impacting the fish. There is therefore little margin for error. 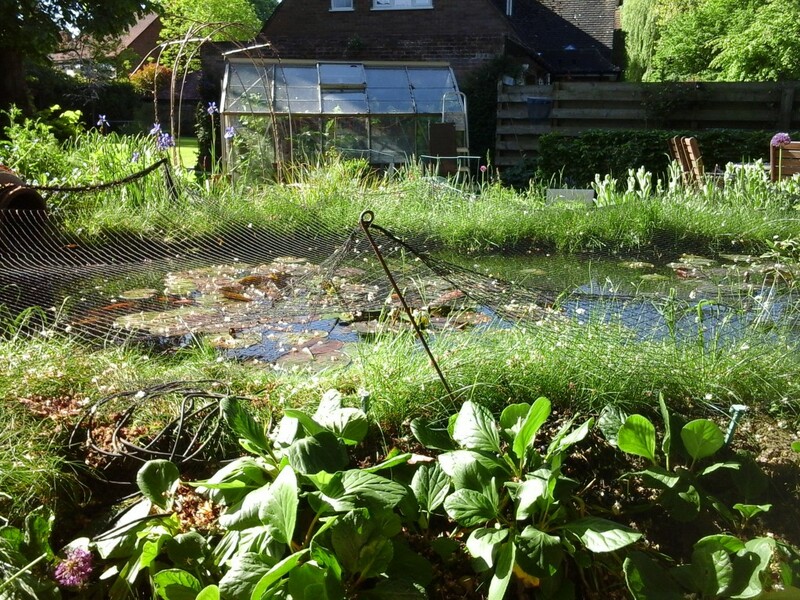 And pond plants may start to grow faster, further competing with the fish. And even if the fish don’t die of oxygen deprivation, they will become more vulnerable to parasite attack. Or become stressed, the No.1 fish killer. Your fish will be stressed if the temperature is over 90 degrees for any sustained period. In my experience koi are much more vulnerable to low oxygen levels. Don’t let them succumb to the effects of hot weather on your pond. Should fish die when you are away, the rotting corpse will contaminate the water further, adding to your problems. The water needs to be shaded from the sun. Your pond is where it is, so unless you planned it to have shade you may not be able to quickly introduce any. Make sure that two thirds of the surface is covered by large leaves like water lillies. Moving the water pump to produce more water circulation will also help, as will creating a waterfall or fountain. If you don’t have an air pump get one installed. They can be bought for as little as £20. Reduce the amount of food, and the frequency of feeding. Also try to feed only when the water is cooler, early in the morning or later in the evening. Decomposition of food in warmer water will cause problems with ammonia and oxygen levels. I have kept an air pump in my pond as an emergency back up for some time. In the event the circulation or aeration from the filter is reduced or stops the air stones provide oxygen to the water. Your pond is in danger when you go away on holiday. If the power goes off having a pump will make no difference. Unless it’s solar powered. These are available for about £50. Arguably the most logical solution to have a solar powered pump, which will be powered when it is hot – when it’s needed – and off when it isn’t needed. And it provides a backup in the event of power failure too. In the US where it is consistently hotter than the UK a common way to keep the pond area cooler is by misting. A fine mist around the pond can lower the temperature by up to 20 degrees F.
You may have invested a lot of time, money and passion in your pond. Planning for the effect of hot weather on your pond, and a contingency in case of power failure makes sense given the relatively low cost. Probably less than the cost of replacing just one 12 inch koi.